Now Grover and the rest of his Sesame Street pals try their hardest to keep readers away from the monster on an iphone or ipad with “The Monster at the End of This Book” app. At $4.99, the app edition has been updated with animations, narrations and a word highlighter. The story truly comes alive with interactive play and touch-point animation. Tablettoddlers took a look and highly recommends. 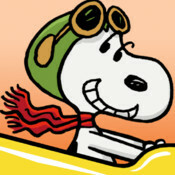 Tablettoddlers is loving the new Snoopy Coaster app for the iPad. Totally addictive and easy to learn. It’s a fun game that doesn’t take much time to get into. Special shout out to friend of Tablettoddlers Chris Kenneally, host of the Beyond the Book podcast, for pointing us to this nugget in Boston Magazine about the Boston Public Library’s new iPad rental program. As you know, Boston is home to Tablettoddlers so we’re thrilled with this development. Parents can borrow iPads stocked with books and apps and keep them for up to two weeks. The iPads shouldn’t replace traditional books, but it certainly is a nice supplement. We just bought a Kindle Fire and without ever seeing one, my 6 year-old daughter figured out the OS in literally less than a minute and was watching SpongeBob SquarePants via the Hulu+ app. Kindoma Storytime, an iPad app, allows two people to read an e-book together, with both faces and the book appearing on each person’s screen. Very cool stuff. Read the NY Times article about it here.